Rice water is used as an electrolyte-replacing beverage during bouts of acute diarrhea. A study published in July 1981 in the "Lancet" reported that rice water was more effective than an electrolyte solution in reducing the number of bowel movements in babies with acute diarrhea. No special ingredients are necessary for rice water, and you can easily make it yourself at home. Measure ½ cup of brown rice into a large saucepan for each person who will be drinking the rice water for a one-day supply. Add 6 cups of water for every 1 cup of brown rice. For example, use 3 cups of water for ½ cup of rice. Bring the rice to a boil over medium heat. Cook the rice water at a low boil for about 45 minutes. Remove the rice water from the heat. Strain out the rice by pouring the water through a colander or cheesecloth. Store the rice water in the refrigerator and drink it throughout the day. Eat the rice as well, rather than discarding it. 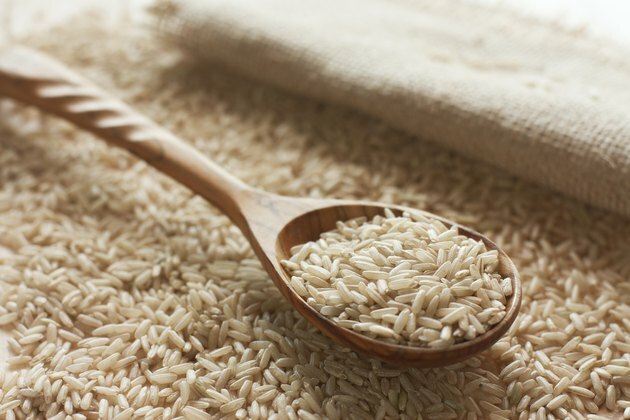 Rice is a mild, easily digested food that will be less likely to irritate your digestive system while you recuperate.